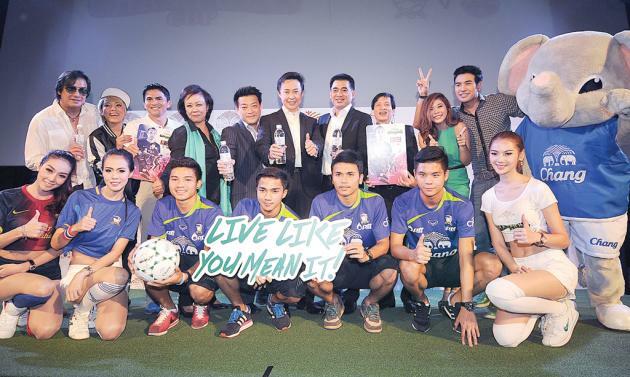 ThaiBev, the maker of Chang beer, said it would give the Thai national football team 1 million baht for each goal they score in an upcoming match against FC Barcelona. The "Chang Champions Cup-FC Barcelona Asian Tour 2013" exhibition match on Aug. 7 pits the national team against a Barcelona side bristling with world-class talents, including Argentine maestro Lionel Messi, at Rajamangala National Stadium. ThaiBev, who are sponsors of Barca, said they wanted to make the match more exciting by giving the home players added incentive. "Of course, all the lads and me are excited by the prospect of facing such a top team as Barca," said former national striker Kiatisak "Zico" Senamuang. "We beat China 5-1 in a friendly recently and we want to prove it was not a fluke. We want to see how we fare against such strong opponents." "เราเอาชนะทีมชาติจีน 5-1 ในนัดกระชับมิตรเมื่อเร็วๆ นี้ และเราต้องการจะพิสูจน์ว่าไม่ได้ชนะเพราะความบังเอิญ เราอยากรู้ว่าเมื่อเทียบกับคู่แข่งที่แข็งแกร่งเราจะทำได้ดีขนาดไหน"